Automation advances in helicopters are being highlighted in the static display area, with an SD-150 Hero RUAS from Sistemi Dinamici S.p.A. in the foreground and a PZL-Swidnik SW-4 Solo behind it. A pilot is optional aboard the SW-4 while the SD-150, the product of a joint venture between IDS and AgustaWestland, can fly autonomous, preprogrammed missions. 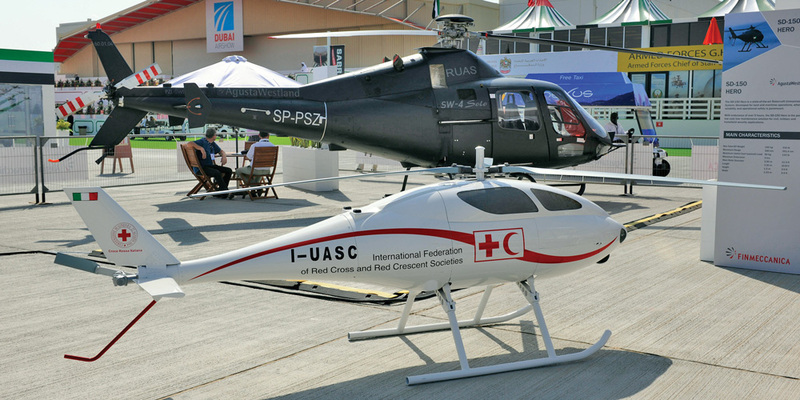 AgustaWestland is showing off its RUAS (rotary-wing unmanned air system) technology demonstrator for the first time at Dubai. Based on the EASA-certified, single-engined PZL-Swidnik (AgustaWestland Poland) SW-4 Solo helicopter that entered service with the Polish armed forces in 2002, the RUAS is being used for a number of demonstrations and is configured for OPH (optionally piloted helicopter) operations. Although the SW-4 RUAS itself is capable of ISR and cargo transport missions, with or without a pilot, the technology could also be applied to other AgustaWestland types. Also on display is the smaller SD-150 HERO, which the company is marketing it as a lower-cost platform for similar missions. First announced in 2010, the SW-4 RUAS/OPH project was developed to evaluate a range of unmanned technologies. It integrates a flight management system, flight control system and digital autopilot with precision navigation. The system incorporates numerous automatic safety features to cover issues such as engine failure, autorotation, vortex ring state, terrain avoidance and lost datalink. A ground control system provides flight planning and mission management functions, including inflight reprogramming, and is equipped with three datalinks. There is a narrow-band line-of-sight link for platform command and control, plus a back-up. A wide-band line-of-sight link transmits sensor payload imagery and data. Initial trials were conducted under a contract to the Italian defense ministry, and ran from September 2013 and May 2014. Undertaken in Poland and Italy, the trials were flown in OPH mode with a safety pilot on board. The tests began with the unmanned control systems and ended with the remote execution of mission profiles. In 2013, AgustaWestland was awarded a CCD (capability concept demonstration) by the UK MoD to outline future Royal Navy options regarding unmanned and optionally piloted helicopters. As part of the CCD AgustaWestland and industry partners evaluated a range of helicopter sizes in long-endurance maritime roles such as mine hunting, hydrographic survey and surveillance. An important element of the CCD was a campaign of OPH trials using the SW-4. In May this year, the demonstrator operated from Llanbedr, Wales on a series of trials that included 27 flight hours. The first phase covered launch and recovery, mission management and compatibility with a ship combat management system. In the second phase, the RUAS conducted simulated deck recovery trials, landing 22 times on a simulated ship’s landing deck being towed behind a vehicle. In the final phase, the helicopter conducted simulated maritime security and littoral reconnaissance missions. Also this year the SW-4 was operated successfully during the European Defence Agency’s Italian Blade exercise, demonstrating ISTAR capabilities, manned-unmanned teaming and data dissemination. The SD-150 HERO is a 400-pound-mtow unmanned helicopter that can carry 44 pounds of payload on its nose and 154 pounds under its belly. Just like the SW-4, it has a six-hour endurance. It is well suited for “dirty, dangerous and dull” missions and can carry sensors that are comparable to the SW-4 Solo’s, AgustaWestland’s senior v-p for marketing James Wand said here at the show. The smaller payload may translate into lower resolution images. Extensive flight testing has taken place and a simulated ship deck landing is the next step, Wang said. The SD-150 shares a common control console with the SW-4 Solo. It has a triple redundant GPS, inertial navigation system and flight control system. It is powered by a 50-hp diesel engine and has a three-meter-diameter rotor. Another Italian company, IDS, was involved in the design through a joint venture with AgustaWestland. An improved SW-4, with enhanced capability, will be introduced at the Heli-Expo show in March 2016 in Louisville, Kentucky, AgustaWestland’s senior v-p for marketing James Wand hinted on Sunday. Answering a remark about AgustaWestland no longer producing the SW-4 at its PZL-Swidnik factory, he said the company is counting on synergy between the manned and unmanned platforms. The SW-4 is a five-seater and can be seen as a competitor to the Airbus Helicopters H120 and the Bell 505 Jet Ranger X.